Losing a friend or a loved one is a grounding experience. There are too many emotions to name, especially for the executor of the estate. Carrying out the deceased’s last wishes is a heavy responsibility, but one that comes with an incredible amount of trust and honor. The deceased has chosen you, overall, to ensure his or her possessions, property and personal items are seen after. If you have recently been named an estate executor, either by a last will and testament or by the court, you are responsible for important matters like finalizing the deceased’s remaining assets. For many people, their home is their largest asset, so it also can be the executor’s largest challenge. The executor of an estate can be asked to take charge during a frustrating and stressful time, but it can also be very rewarding. What can you expect as the executor of an estate? Here is a list of five things to pay close attention to if you’ve been named the executor of an estate. Understand your roles, responsibilities, and rights as an executor of an estate. Usually, the executor is responsible for finding and managing the deceased person’s assets and ensure they are distributed to inheritors. Sometimes, an executor is also required to make decisions around selling real estate or properties owned by the deceased. You may also have to take care of safety deposit boxes or valuables in safes at the house. The executor of an estate takes the lead in resolving the deceased’s remaining business. For example, you may have sentimental responsibilities, like sorting through the deceased’s belongings, while also handling legal affairs, such as making sure the homeowner’s policy is paid or maintenance is done on the home. Taking care of property, bills, taxes, and inheritances can be stressful and complex, even for a small estate. It’s up to you to decide if you want to charge for your executor services. Most close friends and family members take on this responsibility for free. Some states have requirements about paying executors for their time devoted to the deceased’s estate. Whatever you decide, rest assured you are giving a great deal of relief to the deceased and the family, knowing someone trustworthy is handling affairs after death. Get the property in the estate ready to sell. Before you consider creating a real estate listing for the decedent’s estate, contact the IRS. They may need to release that property from the estate or a lien before it can be sold. Talk with a professional to make sure you know all the steps specific to your situation. Once you know if the property can be put up for sale, you’ll want to contact a realtor or determine a sales strategy. Getting the property ready to sell is about more than aesthetics. Your loved one felt this house was a home; you can help another family feel the same way and ensure the inheritors receive the deceased’s last wishes. When preparing a house for sale, start with removing any old, worn or broken furniture. Take a look at the walls — you might have to touch up and repaint them. Modernizing an older house can also help increase the sale price. Get some quotes from contractors to make upgrades that your real estate agent recommends. Replace dated light fixtures, patch cracks in the ceiling, and paint and change outdated curtains, blinds, and other window coverings. Serving as an estate executor can be very time-consuming, and a lot of the legalese can be complicated. However, being an executor doesn’t mean you have to carry the entire burden alone. There are professionals who can help you manage your most complicated duties, especially those that need specific legal or financial expertise. An estate lawyer can coach you through legal questions and situations as they arise. A lawyer could also conduct research on specific matters and look over paperwork before filing. They can also help obtain legal documents like a grant of probate or prepare an estate tax return. A certified professional accountant (CPA) can help with financial matters, while other professional document preparers can help keep the executor of an estate organized and on top of deadlines. However, these fees are paid by the estate, so bringing on professional help might reduce the amount that the beneficiaries expect to receive. Don’t overlook day-to-day details in the estate. It might seem like small potatoes during such a complex time, but keeping up with the minutia is essential to managing the estate. The executor may need to terminate building leases, close credit lines and set up an estate bank account. Some expenses will still need to be paid and that responsibility falls to the executor of the estate. Depending on the situation, you may need to continue payments on utilities, mortgages and homeowner’s insurance. The executor will need to reach out to organizations and companies on the deceased’s behalf. Important entities, like banks and government agencies, rely on estate executors to notify them of the death. What may begin as a short list can quickly become more complex. Keep a list of these details and a record of who has been called and still needs to be contacted. Most likely, you will need to reach out to the Social Security Administration (SSA) and post office. There’s even a chance you’ll need to contact Medicare or the Department of Veterans Affairs (VA). Take your time and get things done right. 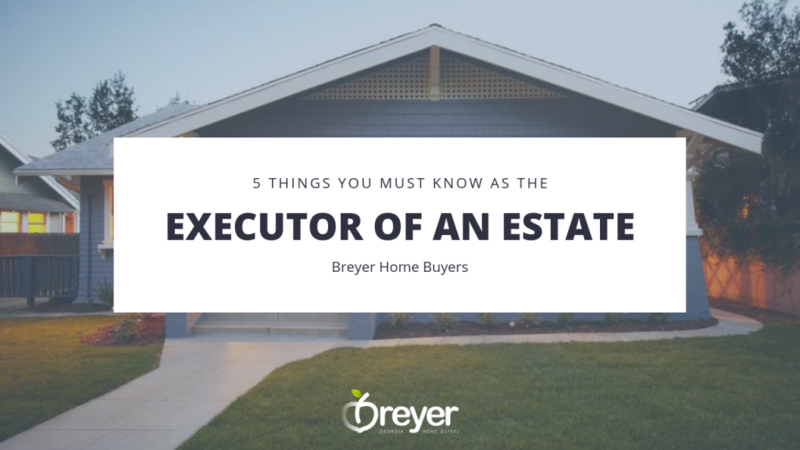 There are going to be deadlines and due dates, and the executor usually has many responsibilities to take care of before property can go on sale or inheritances distributed. For the most part, the process takes six months to a year, but it’s not uncommon to encounter unexpected delays when distributing the deceased’s items, closing out financials, and getting the property on the market for sale. There will be times when you feel rushed or frustrated when people around you forget to give you the space you need to make sure the deceased’s last wishes are carried out correctly. The executor of an estate needs to tap into a deep well of patience. There will be mandatory time frames that you have to operate in, such as submitting the notice to creditors and opening probate, that should give you the breathing room you need to make the right decisions with confidence. Being named the executor of an estate is a great honor and a great responsibility. If you find yourself in these shoes, it’s important to get educated about the process. No matter the size of an estate — whether it includes one house or 10 — many of the steps are still the same. Here’s a brief list of some of the most important duties of an executor of an estate. Secure a copy of the death certificate. Get the deceased’s most current will, trusts, deeds, and titles. Obtain a grant of probate from the court that confirms the will is legal and valid and empowers the executor to take care of the deceased’s estate. Pay attention to special taxes for estates, like capital gains taxes, inheritance taxes, and property taxes. Organize all of the deceased’s assets, including houses, vacation homes, rental properties, and businesses. Check with the deceased’s banks, as well as credit card and other lenders. Find out information on mortgages, leases, and taxes. Collect money owed to the deceased and the estate. Locate all valuable household and personal property in order to inventory them for the inheritors and taxes, as well as protect them during probate. Collect all life insurance proceeds payable to the estate. Examine and deny improper claims against the estate, while paying valid claims. Handling the estate of a friend or loved one can take its toll, but the more you prepare and anticipate your duties and challenges, the fewer obstacles you’ll face when it’s time to take action. Struggling with cleaning out and maintaining the property you are managing? Are there too many repairs needed to list the property with a Realtor? Selling your inherited house directly to a cash investor may be an option. When you sell to a company like Breyer Home Buyers, you can simply take what you want from the house and walk away from the rest. We will clean out the house ourselves, saving you from the emotional burden of sorting through your loved one’s belongings. You can skip the fix-up, managing contractors, and spending thousands on repairs. We will buy the house as-is and make the repairs ourselves. Fill out the form below and get a no pressure, no obligation cash offer on the house.